Please see that I have sold many LV Bags and my buyers are Very Happy! 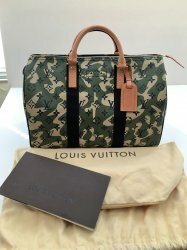 It's a must have for LV Lovers and Collectors. It is absolutely amazing and is a collectible. This is so very hard to find...Almost impossible! Babsstudio1 was lucky enough to have gotten this one! It will be shipped to you as if you had just bought it from the store! What a great gift this would make! !